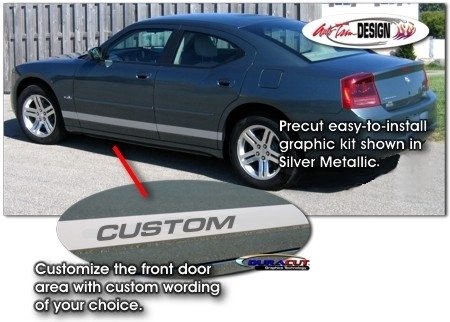 Dress up your '06-Current Dodge Charger with this classic body side graphic set. Available in a wide variety of colors, graphic is packaged with one (1) left and one (1) right side graphic. Go ahead and customize your kit with unique wording on the leading edge of each front door. Simply enter the Custom Wording of your choice (up to seven  letters/digits/spaces) and we'll make it happen. Either way it'll look Terrific! Slight trimming required at doors jambs and at each wheelwell. Bottom of graphic is designed to be set at lower body line as shown. While kit is shown on a Dodge Charger, it may also be used on a wide range of other vehicle applications.